Does a human being have to enter their car like this? Following after Super Junior Heechul’s rant on sasaeng fans, or fans who obsessively stalk a star, it’s come to light that now they’ve gone as far as installing CCTVs at the residence of celebrities. On July 10, a shocking compilation of photos were uploaded online on various communities. 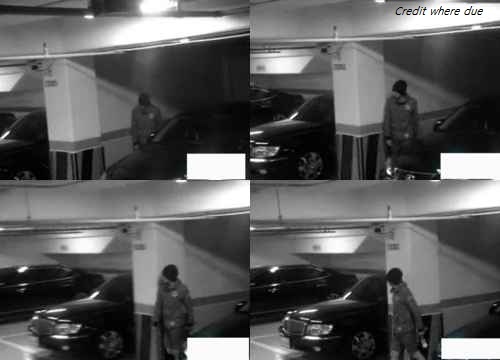 The photos were from a CCTV that was installed in the parking lot of JYJ Park Yoo Chun’s house. The photos show Park Yoo Chun getting into his car on multiple occasions, sometimes even hiding behind walls to avoid sasaeng fans. The photos called quite a stir as netizens became outraged that people who call themselves fans could install their personal cameras to observe Park Yoo Chun in this manner, let alone, upload the images online. Ironically, the JYJ members were criticized last March when the members were recorded cursing at sasaeng fans.